Arsenal have trained on an artificial pitch as under-fire boss Arsene Wenger aims to avoid FA Cup embarrassment against non-league Sutton. 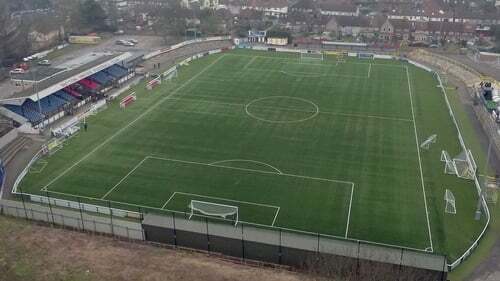 The National League side play on a 3G surface at their Gander Green Lane ground and Wenger has admitted the pitch is the biggest problem his men will have to deal with tonight (7.55pm). Football League sides Leeds, AFC Wimbledon and Cheltenham have all failed to win at the ground in this season's competition and should Arsenal be added to that list, the pressure on Wenger will intensify. The Frenchman's 20-year reign has come under scrutiny following a 5-1 Champions League thrashing at Bayern Munich last week, while two defeats in three Premier League games have all-but ended hopes of a domestic title. With the FA Cup appearing to offer Wenger the best chance of silverware this season, the Gunners manager has left nothing to chance in his preparations. Asked what the main dangers facing his side would be, Wenger said: "First of all the pitch. "Secondly their enthusiasm and thirdly that we are not ready for a big fight and subconsciously think that they are a non-league team and it is no matter - but that will not happen. "Ideally we would like to play on a normal pitch but it has been accepted and the competition is to deal with what you face. We will face an unusual pitch and we will have to deal with it. "We will practise inside because it is an artificial pitch. It is not the same because it is a dry pitch and Sutton I have heard have a wet pitch which they water before the game and is quicker. "The weight on the joints is different and you cannot slide to block every time so it makes football a bit different. The ball comes to you suddenly and accelerates and does not slow down like in a normal game, so we have to get used to the different speed." Wenger suggested he will name a "normal team" - not encouraging news for his opposite number Paul Doswell, who said his side have no chance against a first-choice Gunners line-up. "If he plays the team that beat Southampton 5-0 in the last round, then that would hammer us," said the Sutton boss. "I think if you see Mesut Ozil and Alexis Sanchez on the team sheet, our chance doesn't come beyond nought. But if they put another team out then it does get up to the one and two per cents. "Our only chance is if he puts out an under-23 reserve side because National League sides can compete against academy players. "If we were to get a draw and we could get back to the Emirates Stadium it would be one of the biggest results in the cup's history and for the players. I think half of my team support Arsenal." The winners of the tie will host National League leaders Lincoln in the quarter-finals.